Fischer Seeds has been raising high quality seed since 1938. In the spirit of that tradition, Fischer Seeds contracts and conditions soybean and wheat for seed that exceeds strict quality requirements. Being a producer and processor allows us to track our product through the entire production process. We carefully manage every step, from planting the seed to monitoring the growing process, harvesting the seed, processing the seed through the conditioning facility and packaging seed into bags for the next season to ensure product integrity. We are proud of our careful processing and high standards which allow us to provide the best product to our customers. 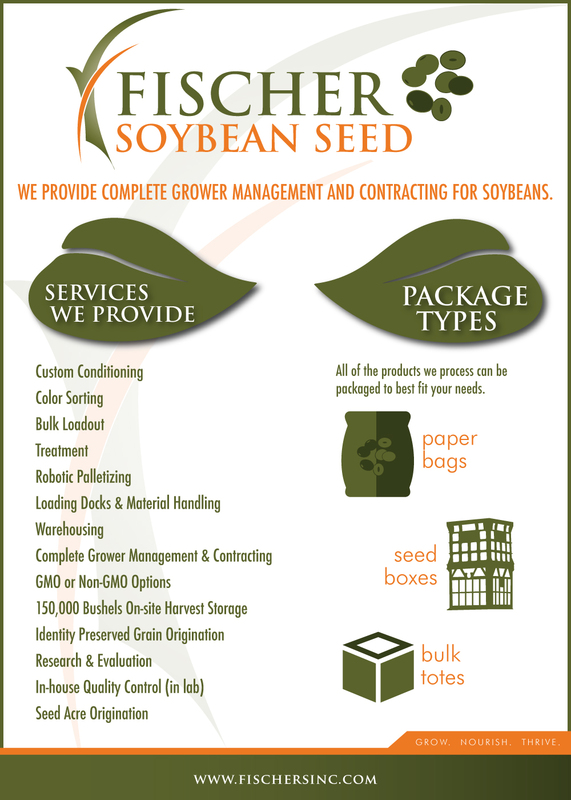 We are known for our seed management competence and ability to successfully handle a variety of treatment and packaging options. By blending state-of-the-art operating procedures with time tested best practices of seedsmanship, we are able to provide the quality and quantity of product to fit your needs.